So, as of today all alum & steel from countries like China will now have a tariff of 15% & 25%. As we know, our industry buys a LOT from China, especially a lot of cheap products. I haven't looked into it but I know there are quite a few alum companies who's coils and pre-finished aluminum sheets will now cost a lot higher. I wonder if those finished alum projects will have a tariff too, such as alum letters and alum sign structures? Maybe hard in the beginning, costs will go up, but hopefully American growth will happen again and those costs with lower regulation can get those costs down and start competing on the world market again. After all shouldn't a tax be equal between two countries? If China taxes our exports to them 25%, should we not equally tax theirs? Thoughts? 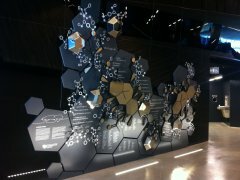 Background molecules mounted to slanted glass wall. These were made out of 1.5" designboard, painted and then vinyl applied for the donor names. Custom welded steel frame with chrome-dipped steel inserts. The 3D molecule shapes were out of sheet metal and then chrome-dipped. The 'fronds' were waterjet out of 1/8" aluminum and aluminum studs installed for various height placement.